Below are brief summaries of some of our loyal donors. The stories are posted in random order. Dr. Carolyn Fowle was born in Madison, Nebraska. She and her husband, Charles Fowle, moved to Lodi in 1952. Dr. Fowle was a kindergarten teacher at that time and then became a Clinical Psychologist in 1965. Her practice has contributed to the health of our community for decades and her support of the Lodi Memorial Hospital and the Foundation is exceptional. Not only is she a long standing member of our Mullen Society but she has contributed significant funds over several decades to such an extent that the Healing Garden Courtyard at the Hospital is named: Dr. Carolyn M. Fowle & Henry C. Ybarra. She can be counted upon for each event we hold and for any new initiative of the Foundation. She truly is the rock of our foundation. Ole & Dorothy Mettler were born and raised in Lodi. In fact, Ole & Dorothy reside in Ole's childhood home and Dorothy was raised a half mile up the road. Ole's father, E.J. Mettler, was one of the original members who were instrumental in the founding of Lodi Memorial Hospital. Ole like his father served on the Lodi Memorial Hospital Board for nearly twenty years and was the Chairman for much of that time. 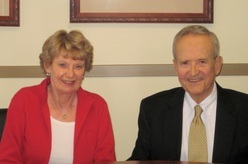 Their two children, Joan Rider and Bruce Mettler represent the third generation of Mettlers that support Lodi Health and Lodi Memorial Hospital Foundation. Bruce still lives across the street from the family home built in 1923, and has carried on his family's tradition of farming and supporting the hospital. With children and grandchildren still in Lodi it appears the Mettler Family Legacy will continue for years to come. The Mullen Society was named for Bob Mullen, one of the original community members who made the dream of a hospital in Lodi a reality. He was also one of the founders of the Lodi Memorial Hospital Foundation, Inc. and remained on the board for twenty years. For twelve of those years, he was the Foundation Board President. The Mullen Society was newly formed honor those that donate a gift in the amount of $10,000. Gifts can be in the form of cash, pledge, gift annuity, stock or an accrual of donations over a period of time. Dr. Kenneth Mullen, son, has practiced medicine in Lodi with hospital priviledges for nearly forty years. This father-son combination has been on of the pillars supporting the founding, growth and future of Lodi Memorial Hospital Foundation. Sue Hernandez and her daughters have donated more than 200 blankets they crocheted for babies at Lodi Memorial Hospital. Their goal is to make 500 blankets, but admit they will probably keep going past that mark. Sue Hernandez and her daughters, all felt babies should have a soft warm blanket when they leave the hospital, a luxury that not all new mothers are able to provide for their babies. They are a perfect example of how people can support in ways other than cash donations. There are hundreds of newborns that have found comfort from their efforts and committment. Thank you for the warm hearts and fast fingers. Steve Diede was born in Berkeley, California and moved to Lodi when he was four years old. He and his siblings were raised on a ranch in Acampo and attended Lodi schools. Steve said, "I enjoyed growing up here and knew that it was a good community to raise children, so my wife, Bo, and I purchased a home and settled in.We have four children and three grandchildren. My family and the majority of my extended family all live in Lodi which made it very convenient to found and grow Diede Construction. His group of companies have built nurmerous project in Lodi and throughout all of Northern California including some work for the hospital and the Foundation. Steve and Bo are Mullen Society members and continue year in and year to be strong supports of the Lodi Memorial Hospital Foundation. Steve currently serves as the Secretary of the Foundation and contributes countless hours to our operations. Thanks to Steve, Bo and all of the Diede's for their legacy of support. Patty Barba & Robin Clay began brainstorming at the hospital's Annual Meeting when they heard about naming opportunities in the South Wing. They had a dream to bring all the nurses together for that opportunity. After much thought and planning, they brought their family of nurses together to name the three nursing stations in the South Wing in honor of the LMH Nursing Staff. At the conclusion of their project they were delighted when they realized that each nursing department and all clinics were represented with other donations and pledges. These are employees we all strive to be and ones that believe we are all "better together". Thank you for your compassion and leadership. Pat Patrick, Lodi Chamber President, was born in Sapulpa, OK and came to Lodi in 1987 to work at Goehring Meat. The job and the "charm of the community" are what brought him to Lodi. Pat was the Vice President of Fund Development and Marketing for United Way in the 90's and became the Chamber president in June of 2001. Pat currently sits on the Lodi Health Board of Directors and has been an avid supporter of the hospital and a regular donor of the LMH Foundation. He is present at each of our annual events and is a great ambassador for our misssion. Thank you Pat for all you do. Cecil Dillon was born in Lodi. He is married and has one daughter. Cecil is a partner in Dillon Murphy Civil Engineering. 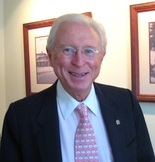 Cecil joined the Lodi Memorial Hospital Board of Directors in1990 and served as President between 2002 and 2013. 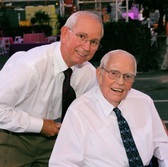 Cecil continues to be a loyal donor and friend of the hospital. He is often consulted by the current Board on matters that impact the hospital and he led the effort to create an affiliation with Adventist Health. Thank you Cecil for your vision, committment and leadership all of which has made Lodi Health an excellent center of healthcare in our community. Annette Murdaca was born and raised in Lodi and Jim Murdaca came to Lodi to run his Pietro's restaurant over twenty five years ago. Annette served on the hospital board for fifteen years and is a philanthrophic leader in Lodi hosting numerous events to raise funds for important causes in our community. 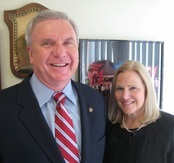 Jim and Annette have been loyal and significant supporters of Lodi Health and in 2008 committed to fuding a Family Waiting Room on the third floor of the new South Tower. Their generous gift provides a comforting setting for families to commune and relax while supporting loved ones in the hospital. The large room contains a library of books and views of Mt. Diablo out of the panoramic wall of glass. We appreciate the tradition of service and support from the Murdaca family. Randy was born in Modesto and wife, Jodie was born in Glendale. They met while they were both attending UOP where Randy played water polo and swam. Jodie, recently retired from a 25-year career, touching the lives of kindergarteners. Randy was a partner at Sunwest Swim and Tennis Club and was the Mayor of Lodi in 1992. He is currently a partner in Wentland-Snider Property Management. He has served on too many boards to list here and recently received the pretigous 2014 Citizen of the Year award. He has been inducted to the numerous sports halls of fame but still finds time to serve as the President of the Lodi Memorial Hosptial Foundation Board. The results of his community committment can be seen all over Lodi. Randy and Jody are Mullen Society members and has formed a Chairitable Remainder Trust with the Foundation. Jan Chandler was born at Lodi Memorial Hospital shortly after it opened in 1953. She is a 3rd generation Lodian, with the 5th generation recently born at LMH. Her family has owned San Joaquin Sulphur Co., Inc. since 1957 and employs 3 generations. "The people in Lodi are genuine, my customers are like family. I can't imagine doing business anywhere else. I am a firm believer in giving back to the community that supports me." Not only has Jan taken the President's position at San Joaquin Sulphur Co. but she also is a Past President of the Lodi Memorial Hospital Foundation Board. Jan's leadership both in governance and philantrohy has been a driving force in the growth of the Foundation. Her legacy will forever impact our community. Thank you Jan.
Dr. Bob Breckenridge was born in the Yucatan. His family moved to California to join other family members where he graduated from Lodi Academy then onto Loma Linda Universtiy where he graduated medical school. He practiced medicine at Lodi Memorial Hospital from 1969 through the mid-1980s when he started a private practice in oral and maxillofacial surgery, from which he retired in 2012. Dr. Breckenridge served on numerous boards including the Center for Dential Facial Deformity in San Francisco providing corrective surgery to those less fortunate. 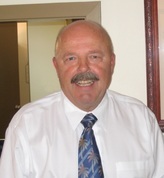 After retiring from full-time practice he taught at the University of Pacific Dental School. As a long time donor to the hospital and the Foundation, Dr. Breckenridge entered our Planned Giving Program and donated a commercial building the a new Chairitable Remainder Trust from which he receives income while the Lodi Memorial Hospital Foundation took ownership of the property. At the termination of the trust the asset will remain with the Foundation and continue to provide support for the future. Thank you Dr. B. for your gift and yor estute approach to planning you retirement and the support of our mission. 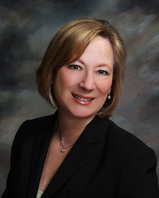 Cynthia Soto has worked at Lodi Memorial Hospital since 1998. In 2010, Cynthia was the recipient of a Lodi Memorial Foundation Scholarship which she used uccessfully complete her Master Degree in nursing. Currently, Cynthia is one of Lodi Memorial Hospital's supervisors overseeing staffing for the hospital and patient flow. She is a real life example of how a dedicated employee can better serve with a small amount of support. She continues to be part of the team that gives back to our community through professionalism and compassion. 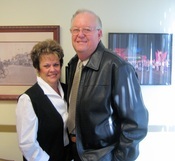 Bill & Carol have demonstrated over and over for many years how they feel about their adopted community of Lodi. There contributions can be seen at every corner of Lodi. They have been involved in so many worthy projects it is hard to list in one place. Bill and Carol grew up in Southern California and have known each other since they were 12 years old. Now, married over50 years, they have three wonderful children, Chris, Cheryl, and Mark, and eight grandchildren, most of whom are involved in their family business of constructing modular buildings. If there is a need in Lodi the Meehleis' are at the top of the must-call list. Thank you for all you have done for so many and also for including Lodi Memorial Hospital Foundation on your list. Mark is a second generation Stocktonian and has been married to his wife Shanda for 22 years. Mark graduated from UOP in 1981 with a degree in Business. His career includes a position at St. Joseph's Hospital, involvement with OMNI Healthcare, Human Resources at Bank of Stockton and Dameron Hospital. He came to Lodi Memorial Hospital in 2000 as Director of Human Resources for over 800 employees, which has increased in eleven years to nearly 1400 employees. Mark is known for his friendly nature and sincere relationships with his fellow employees. He never misses an opportunity to support the Lodi Memorial Hospital Foundation with donations of time as well as funds. He has been the Master of Ceremonies for several Foundation events motivating donors to dig deeper in support of our mission. Mark also served as the Interim Director of the Lodi Memorial Hospital Foundation from 2113-2014. Thank you Mark for pulling any oar handed you. Ludwig Bianchi and his wife Linda moved to Lodi from Minnesota in 1936. Ludwig built stills for the farming community up and down the San Joaquin Valley. During WWII he became a welder for Colberg Boat Works in Stockton building mine sweepers. After the war he became the primary maintenance person for many of the original wine establishments in the Lodi area. In 1977, Robert Mondavi asked Ludwig at the age of 65 to come to work for him and be his head man, where he stayed until he retired at the age of 80. Linda was a twenty five year member of the Alicante Auxiliary. Sons, Ronald and Leonard wanted honor their parents so they made a significant donation and named one of the Patient Rooms on the Second Floor at Lodi Health in their memory. Dr. Walter Reiss was born in Nebraska and attending the University of Nebraska. In 1962, Dr. George Williams ran an ad in the Medical Journal looking for a doctor to come to Lodi and practice in a small community and be his partner. Walt answered the call and moved to Lodi with his wife Carol and began his successful practice across the street from the hospital. Walt was the 13th physician to become part of Lodi Memorial Hospital. Carol worked over 10 years for Walt's busy office. In February 1981, Bob Zamora opened his first car dealership in Lodi. His wife, Christine, stayed in Southern California to sell their residence and care for their two children, Deanna and Chris, while expecting their third child, Susie. Christine was adamant that Susie would be born at Lodi Memorial Hospital, which happily occurred in October of 1981. Christine stated "the people and community as a whole are so friendly. Everywhere you go people are always nice. I knew I wanted to raise my family here and plant our roots in this community." The Ledbetter family represents the best of how families work together both in business and community. Together they operate Vino Farms, a comprehensive agricultural business with vast holdings of vineyards in the Central Valley. When patriarch Keith Ledbetter moved to Hawaii in 1983 he handed the reins over to a very capable group of siblings. The success of this family has resulted in diverse and deep community involvement as well as very significant donations to many non-profit organizations. John Ledbetter was instrumental in the formation of the Lodi Community Foundation which has established numerous endowment funds for various causes including the Lodi Memorial Hospital Foundation. The Ledbetters are recognized for their contributions to Lodi Health with the naming of the Ledbetter Maturity Ward. 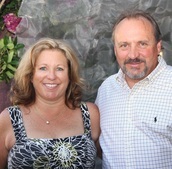 In 1974 Dave and Linda moved to Stockton from the Sacramento area to run Delta Medical Labs. Dave became the Director of Labs at Lodi Memorial Hospital in 1990, which was later relocated to the Conrad Building. Dave and his coworkers moved specimens in a timely manner back and forth to the hospital to ensure patients received the quality of care they expected when they come to Lodi Memorial Hospital. His dedication has had a major impact on the treatment, recovery and general health of patients in our community.